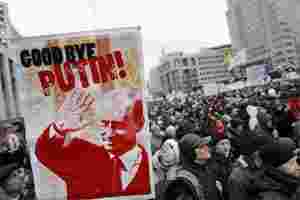 Moscow: Vladimir Putin still has the support of a majority of Russians, his spokesman said on Sunday after a mass protest challenged the premier’s authority two months before he stands in presidential polls. Organizers said 120,000 people attended the rally in central Moscow on Saturday where protesters chanted slogans against Prime Minister Putin and called for the annulment of disputed December parliamentary elections won by his party. “As a politician and a presidential candidate, Putin still has the support of a majority. And we should treat the opinion of a majority with respect," his spokesman Dmitry Peskov said. He added that Putin was “beyond competition" as a candidate in the 4 March 2012 presidential polls, where the Russian strongman plans to stand for a third Kremlin term after his four-year stint as prime minister. Peskov acknowledged the protest had taken place and said the demonstrators’ position was to be treated with respect. “Those people who came out onto the streets— they are a very important part of society. But they are a minority." The last Soviet leader Mikhail Gorbachev had late on Saturday dramatically called on Putin to quit, just as he had done on 25 December 1991 when the USSR collapsed exactly two decades ago. The protest movement— which brings together a charismatic anti-corruption blogger, a detective story writer, musicians and a former finance minister—does not so far have a clear leader, but is gaining momentum. “This is not an outburst which will die down. This is not about the protests but about the mood," Yevgeny Gontmakher, head of the Centre for Social Policies at the Moscow-based Economics Institute, said. “There is a danger of a revolution. Authorities are making concessions, but are not keeping up with the development of the events." The leaders have not said when the next protest will take place and one of the most prominent opposition figures, politician Vladimir Ryzhkov, admitted that there were “several points of view" within the movement on the timing. Ryzhkov told Moscow Echo, a radio channel, he would prefer the next rally to take place in March to coincide with the presidential polls, but he said some of his colleagues wanted a rally at the end of January. The opposition set up a Facebook page to coordinate and debate the timing of future protests. Another leading figure, 35-year-old blogger Alexei Navalny, provocatively vowed on Saturday that one million people would attend the next anti-Putin rally. The mass protests were triggered by widespread claim of wholesale violations in this month’s parliamentary polls which handed a reduced majority to Putin’s ruling United Russia party. Protesters called for the annulment of the ballot, sacking of the Central Election Commission chief and a re-run of elections. Hoping to ride out a wave of protests, Putin ignored those demands and promised instead a return to the direct election of regional governors and a simplified procedure to register political parties.